Jay-Z, Will and Jada Pinket Smith, Samuel L. Jackson, Usher and many more were among the stars in attendance. Even President Obama had nothing but love for Heavy D, the respected New York-bred rapper who was laid to rest Friday after a star-studded funeral in his Mount Vernon hometown. “I want to read you something and I want you to keep this, Xea,” Sharpton said, before reading it and revealing that it came from the White House. The message drew a thunderous ovation from the 1,500 loved ones and friends — which included numerous stars — gathered at Grace Baptist Church for the private service. The emotional service was filled with thoughtful remarks and soulful performances from Heavy D’s famous friends. 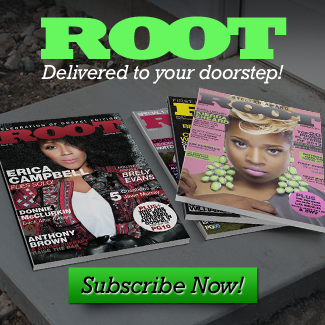 Johnny Gill, Yolanda Adams, Anthony Hamilton and Kim Burrell were among the performers. An emotional Gill, wearing dark sunglasses, related his memories of the rapper, who was born Dwight Errington Myers, before giving a moving performance of “Never Would Have Made It,” during which he was backed up by Burrell and a choir. Heavy D was remembered by loved ones as a kind-hearted man who remained modest after making it big as the frontman for the group Heavy D and the Boyz. Celebrities in the huge crowd included musicians Jay-Z, Usher, John Legend and Q-Tip, actors Samuel L. Jackson, Will and Jada Pinket Smith, Queen Latifah and Rosie Perez, along with boxing promoter Don King. Gill and Burrell’s performance brought many to tears. “I want y’all to know that he made it,” said Gill, choking up as he closed his comments. Heavy D died Nov. 8 at age 44 after collapsing outside his Beverly Hills condo. He had sought medical treatment for flu-like symptoms the day before, but officials refused to release the results of a preliminary autopsy, saying that more tests were needed to determine how the rapper died. Queen latifah at the funeral for Rapper Heavy D at the Grace Baptist Church in Mount Vernon. Actor Samuel L. Jackson at the funeral for Rapper Heavy D at the Grace Baptist Church in Mount Vernon. 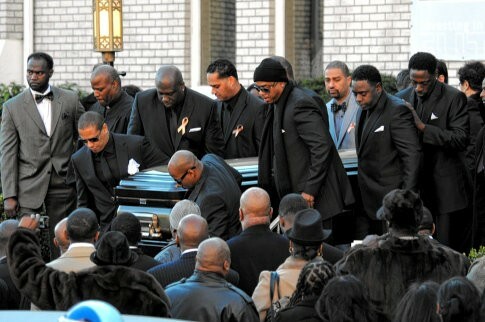 Jay-Z at the funeral for Rapper Heavy D at the Grace Baptist Church in Mount Vernon. Will Smith and Wife Jada at the funeral for Rapper Heavy D at the Grace Baptist Church in Mount Vernon. Usher at the funeral for Rapper Heavy D at the Grace Baptist Church in Mount Vernon.